Today is the birthday of two legends of Indian Music industry. They both together have given some of the golden songs ever composed in the industry. 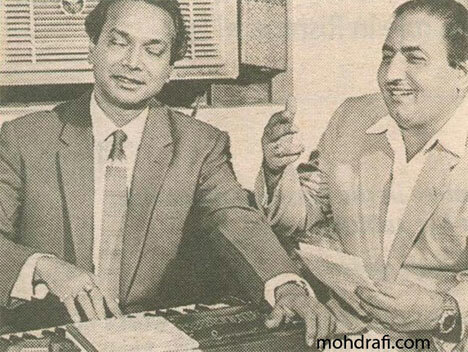 They are the Music Director – Singer duo, Mohammad Rafi and Naushad Ali. Naushad Ali is regarded as one of the greatest Music Directors of Indian Cinema. Since early childhood in Lucknow he was an avid listener to the live orchestras accompanying silent films. He moved to Bombay in the late 1930s to try his luck as a musician but had to really struggle and saw days of acute deprivation. He even had to spend nights on the footpath before he worked as a pianist in composer Mushtaq Hussain’s orchestra. . It was Rattan (1944) that took Naushad right to the top and enabled him to charge Rs 25,000 a film then. Naushad sahib received Dada Saheb Phalke award and is known for his deft adaptation of the classical musical tradition for movies. He could also easily work with Western instruments, including the clarinet, the mandolin, and the accordion. He could incorporate Western musical idioms in his compositions, and compose for Western-style orchestras. Naushad’s composition in the film Dulari, for Mohammad Rafi titled “suhani raat dhal chuki” makes a music lover addicted and it has an appeal even after 60 years of its composition. Is gaane ke baare mein ab naushad sahib khudh hamein batayenge.. Naushad experimented with his classical control in Leader, where Rafi’s songs “tere husn ki kya tariff karun”, “ek shahenshah ne banwake haseen tajmahal”, “apni azaadi ko hum hargeez meeta sakte nahi”, had romantic appeal, classical appeal and the symbol of freedom movement embedded in them. Rafi was outstanding in every song in that film. In Dil Diya Dard Liya, Rafi’s songs “sawan aye ya na aye”, “dilruba maine tere”, “koi sagar dil ko behlata nahi” were masterpieces which matched Naushad’s compositions for Lata “phir teri kanani yaad ayi”. Ram Aur Shayam, the film where Dilip Kumar acted in double roles, had comedy, dance sequences, action and every element for which filmlovers visit cinema halls. Yet Naushad’s composition and Rafi’s songs superseded every other element. Naushad had used folk songs to a great extent where the subjects in the films required them. For example in the film Ganga Jumna, 1961, his composition for Rafi including “nain lar jaihe” was created with bhojpuri effect, and Rafi had succeeded in pronouncing it in the manner expected from him. In Dilip Kumar’s Kohinoor, 1960, Rafi’s songs “madhuban me radhika nachere”, “do sitaron ka zamee par hai Milan aaj ki raat” marks Naushad’s control over bhajans and songs with chorus effects. Baaki ki kahaani, Naushad sahib ki zubani.. Naushad had used Rafi’s classical andaz in the best possible manner. He was rightly awarded Dada Saheb Falke for his epic creations in the 40s, 50s, 60s. Rafi’s archive should contain Naushad’s compositions, because his career was given the right direction by legendary creations of the versatile genius. The song Jis raat ke khwab aaye from the movie Hubba Khatoon is considered to be the last song recorded together by Naushad sahib and Rafi sahib.. This movie/songs of the movie never got released but this song was revived and is considered to be one of the soulful ghazals ever composed..
Rafi sahab was one of my favourite singers, one of the greatest! Naushad Ali was the greatest composer of the world, not only Indian.